Do you love nature and the roses are life for you? Your bouquet is starting to lose the freshness and you find the petals are still fresh. This fact makes you feel low deep inside? Do you trust homemade beautification products? You are clearly having trust issues with the market artificial products and need to work something out yourself? Well, we have a solution to all above all the questions. Speaking broadly, all you need to do is to mix the Epsom salt and soothing powdered milk with baking soda and your favourite rose petals. 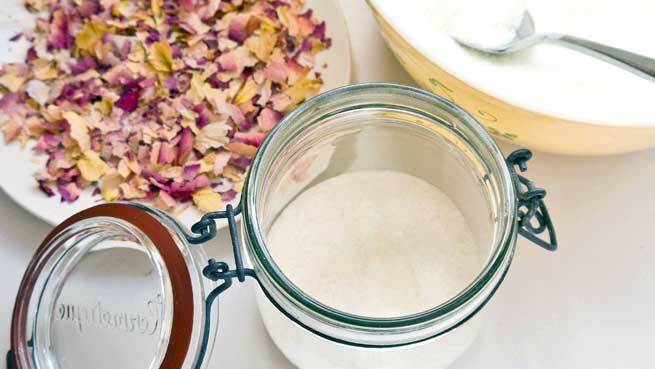 To start with the preparation of your home made solution for rose petal bath salts, you will require following ingredients. 2/3 cup of the powdered milk. Once you have collected all these in your pack, it is the time to work on grounds preparing one of the best possible peaceful bath solutions in your life, ever! The preparation of the rose petal salt should be done with great caution. If prepared as per the guidelines, in a correct manner, the results shall be promising. First of all, separate the petals of the flower. 4-5 roses shall do the job really very fine. Once you do this, next job is to make a use of the rose water or rose essential oil. Spirit the roses using the rose water or simply add a few drops of rose oil. This will elevate the smell of the rose petals and they start to show miraculous scenting floral strength. Alternatively what you can do is to let the petals dry overnight. Once settled with this, you need to prepare a paste of baking soda, Epsom salts and powdered milk. Take the Epsom salt, baking soda and powdered milk in a bowl. Remove all the lumps as much as possible. Epson salt actually soothes sore muscles while the combination of soda and milk soften the skin. Once you mix all of these, now crumble all the rose petals and collect them in a bowl. Mix the mixture and the crumbled rose pieces together. After settling everything, take the glass container and it is the time to start layering the rose petal and salt. Do it till the container is full. Leave this jar closed for a day or two. This is for the reason that better is mingling between the bath salts, the better scent fragrance it will get. Also Read – How to Take Oatmeal Bath for Both Dry Itchy and Oily Skin? The properties of the components of the mixture have a great stress reliving property and thus relieve the stress. The soothing effect caused by the homemade rose petal salt helps one gather a soothing effect after a tiring day! Of all the perks offered by rose petal salt bath, a good long lasting fragrance is definitely the best. This acts as mood balancing tool. This is easy to be prepared and can be applied easily. The rose petals used should be fresh and not stale. They are the basic component and no risk shall be taken with their quality. The ingredients should be mixed in given amount to get the maximum out of it.